Boxes were magical once. There always showed so much promise, excitement, danger and adventure. You must remember that this was a world of sprites, pixels and low polygon ships, a world of limited colours and mode 7. Unlike the modern world where every advert & promotional image must say ‘Not in game footage’, in the 80s and 90s it seemed anything was considered accurate marketing. Boxes need not be an accurate portrayal of a game. They only needed to serve as a suggestion of the experience, a hint of what’s to follow, an interpretation of the truth. The problem was in a world lacking the internet’s wealth of opinion my desire for a game was determined by two things; what Super Play thought and how exciting this ‘anything goes’ box looked. Vortex had a very exciting box. A robot was leaping out of the frame, with a racing car behind it and a Sonic Jet over head. Lasers flicked out around this leaping mech, suggesting a grand escape from some futuristic polygonal strong hold. But the most exciting thing on this box of promises was a logo, the Super FX logo. That Logo was on Starwing and Starwing was incredible, that logo was on Stunt Race FX and that game, (though not as good as Starwing) was like having an arcade at home (or so I believed at the time). That Logo was the future, it was on all games the likes of which I had never played before. 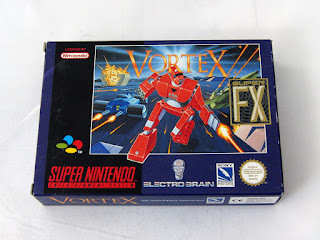 I didn’t even need to read the back of the box, or even flick through a Super Play review, at that moment (probably in Woolworths) I knew I wanted Vortex, it was a Super FX game and it had a Robot that had no respect for picture frame boundaries. But, alas it was not to be. I never owned it in my youth. It was always the one that got away. I can’t quite remember why It wasn’t on my birthday or Christmas list that year. I know it came out late in the Super Nintendo’s life so maybe I had moved onto the PlayStation on the N64 at that point, or perhaps I asked and never got it. But now with a fresh desire to go back to SNES games, it was the second game I pushed into my console. I try to approach these games placing nostalgia aside. They will have aged, particularly the games that had polygon graphics. This is a given, but hopefully the gameplay, the actual enjoyment of a game remains despite its hideous look. So with this in mind Vortex starts well. A quirky little sprite face that wouldn’t look out of place in UN Squadron is talking to me, telling me I’m a hero and that there’s a war going on. Behind his text speech are rotating somewhat elaborate polygon shapes, all moving smoothly and transforming from one thing to the next. Had I seen this in 1994 I would no doubt have thought some sort of witchcraft was at work, like I was viewing something from the not too distant future. Now I can appreciate the intricacy of the models, and the hundred of lines of code it no doubt took but to be honest it looks like a Windows screensaver. The ‘morphing battle system’ you control within the game can actually change between 4 different contraptions, the Robot, a Tank, some sort of Sonic Jet and a Racing car, all depicted on the box art. I recall reading once that this game even started life out as a Transformers game before the license was lost, or some such thing. 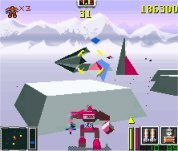 Unlike Starwing (StarFox to everyone not in the UK) however, this game is not an on-rails shooter. It plays similar to ‘all range mode’ in Star Fox Command and Lylat Wars. 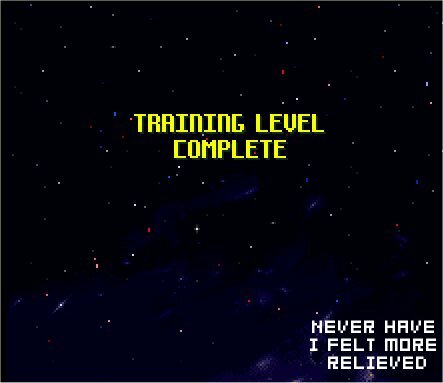 Considering this, on the first level I decided that I would spend most of my time playing as the Sonic Jet, thinking this made the game vaguely resemble Starwing. The map suggested that the level was essentially a corridor so I headed continually north knowing that my options were limited in terms of exploration. I relentless hit the weapon buttons and Enemies were being destroyed so I must have been doing something well and within a few minutes I was greeted by a caption ‘Entering Sector 2’. A very Starwing-esque boss fight had begun. Right, I thought, I recall in the (surprisingly impenetrable) training section I was told the robot had missiles, let’s transform into that guy. This was an idea that was probably as foolish as my initial decision to want a game based solely on box art. My robot limply floated in the air, taunted by an enemy moving on and off screen with a flexibility of movement I couldn’t match. Unlike the Sonic Jet mode, the walker-mech wasn’t able to adjust the pitch of its laser beams so despite my efforts every shot seemed to go above this robot guardian. I would have changed back to the old faithful Sonic Jet but there simply wasn’t time, my off screen foe depleted my energy and the robot hero exploding in a shower of polygons and pixel full stops. Not to worry I thought, I think I know this boss’ weakness I shall be better prepared next attempt. 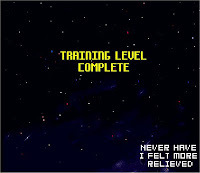 Only however I did not pick up shortly before this seemingly indestructible end of level boss (as is the tradition in these games) I was placed right back at the start of the level. Thinking I had missed some sort of check point, I looked online to see if this was normal and that’s when I learnt the truth- Vortex is hard, brutally brutally hard. In a world of disposable 69p iOS games, I was tempted to just give up at this point and move onto a game where I would have a least some hope of getting beyond the first level, but something caught my eye online. ‘HVZSM’ a 5 random letters that saved Vortex – an invincibility code. Playing through Vortex without the fear of inevitable and seemingly unavoidable death, allows you to appreciate its many merits. I was foolish to try to make it replicate Starwing - It’s a very different game. A more cautious exploration game. Rather than fleeing a storm of lasers (as depicted on the box) you’re far more likely to stealthily single out foes and hunt for pickups. It actually becomes hugely tactical as you flick between each machine mode, with different levels playing to the strengths of each. The 5 game worlds although essentially colour palette shifts, all seem unique, but from a player’s point of view the objectives on each vary considerably. Ambition however is limited by technology, and while I applaud the decision to experiment, play testing should have determined that certain ideas really do not an enjoyable game make. Claustrophobic corridors are confusing and frustrating. Without a sense of depth, or indeed the ability to differentiate between wall and floor you end up going around in circles looking for turnings or even exits. Bosses may be epic in scale, but their size is at the expense of frame rate. And though it’s a fun change of pace to literally race around a collapsing city circuit, its right angled corners prove nigh on impossible to navigate at speed. One thing that really stands out is the soundtrack however, pounding electronica that oozes atmosphere and energy. It may be of its time echoing the likes of 2Unlimited and early Prodigy but it serves as an unexpected high point especially when compared to visuals. Though no doubt astonishing at the time the garish colours and simplistic geometrical shapes have not the charm of sprites to a modern day gamer. Nor do they reflect this now infamous box, though its a far closer approximation than the Japanese’s box art, which is as much somber as it is inaccurate! I’ll be honest, it was probably for the best that I never played this game all those years ago. That box, with its Robot and Lasers and Super FX Logos lied to me. It’s certainly not and all guns blazing mech-morphing Starwing, but that’s not to say it wasn’t an interesting curio of ambition hampered by technology. I can’t say I really enjoyed playing it, or will ever go back to it but in the end it did give me one thing; a desire to replay other far better space based Super FX games. I ended up with Vortex almost by accident. When buying Cannon Fodder the seller emailed to say as an incentive for me to buy another game they’d offer combined postage. Essentially this cost me £6 and distracted me for 5 train journeys!